How funny I had been considering all of the projects in the same way. I wouldn't even know where to start. But like how you divided up your list. I keep a running list of my UFOs in Excel. I've decided that 2018 is going to be the year of the UFO, I'd like to get my list down to under 10. Good luck with whittling down your list. I have considered not blogging anymore....as it seems to have increased my ufo's very muchly!...but I continue on. Oh my goodness, I love this post! I can so relate. Squirrels everywhere!! 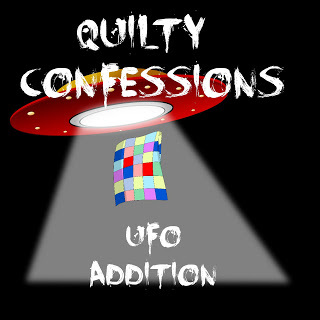 I just pulled all of my UFOs out yesterday and listed them. I was amazed at how I had squirreled them away in various places. Haha. This is going to be a good year, Sandra -- squirrels unite!! You are definitely in good, quilty/guilty company Sandra! We all have so many ideas, plans and projects to create beautiful things. My problem is trying to squeeze in sewing time around family, work, cooking and housework. Yeah, I'm not alone there either! Let's make 2018 a year to get those past projects done! Should be an interesting year seeing how many you get down without running into too many squirrels. I am exactly the same. I bought storage drawers so I can store and easily swap what project I am working on. I am not counting WIPs but will try to finish some. I love making lists. It helps me get more accomplished when I can cross things off. I hope the lists help you as well. I wish you the best in 2018. I wonder what it is that makes it so difficult to finish something when it is such a GREAT feeling when it gets done? Is there some sort of brain chemical emitted when a new project gets started that our body really enjoys? Who knows!! I just know I am needing to get my projects all confessed too so I can start whittling down the number! I am hoping that making this list will help with that!